In this article we are going to cover 3 types of Comparing Database A. Compare Database. 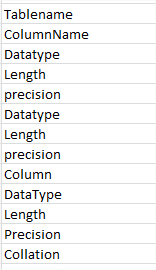 This script compares the table schemas between two SQL Server databases and gives the report for missing columns , data type mismatch , length & precision mismatch and Collation Mismatch. Hope you will like 3 types of Comparing Database A. Compare Database.